! NOW IS THE PEFECT TIME TO START. We recommend starting this plan at least 100 days before your exam date. 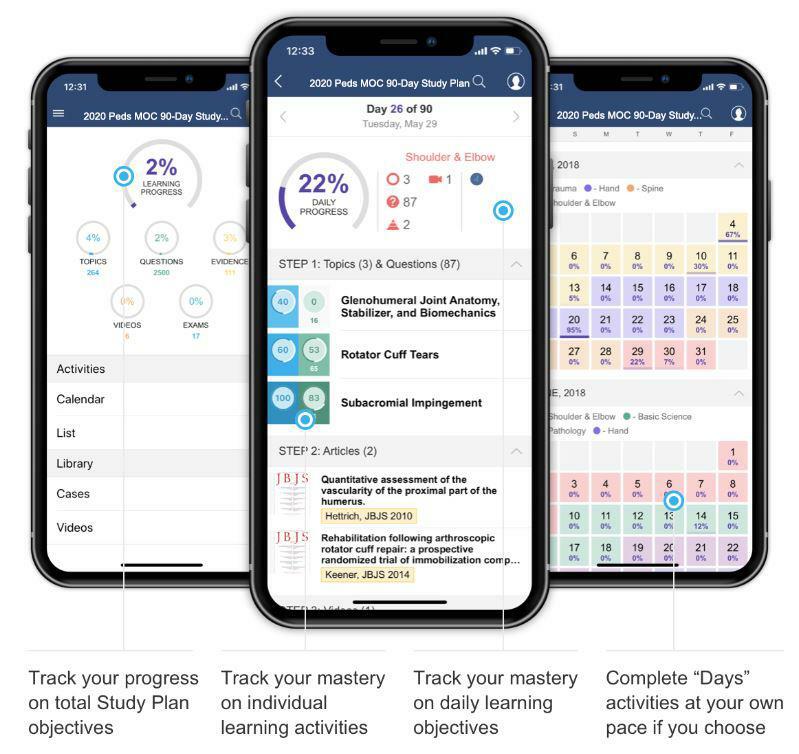 An innovative daily study plan for surgeons preparing for the 2019 MOC General Practice Profiled Exam. Daily emails begin the day after you purchase. Guaranteed you pass the MOC exam and are 100% satisfied or your money back! A comprehensive 90-day reading curriculum covering 336 General Orthopaedic topics, 5007 practice questions, & daily key scientific articles. 15 module exams and 3 mock exams to diagnose your weaknesses, reinforce your learning, and improve your testing performance. 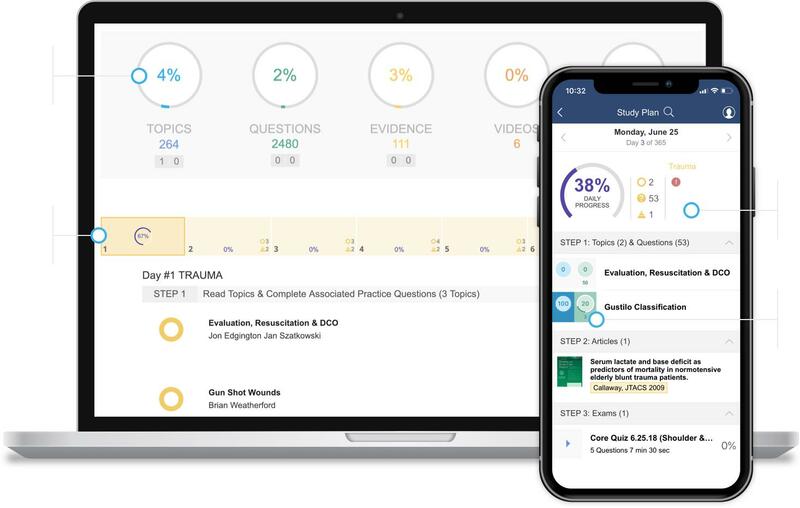 Integration with our new Peak Adaptive Learning Platform helps you learn more efficiently by tracking your progress and directing you to your areas of weakness. Study Plan comes with 12-month subscription to PEAK premium content & premium features. The 2019 General MOC 90-Day Study Plan is designed to prepare US Physicians for the 2019 ABOS Orthopaedic General Practice-Profiled Recertification Examination, which is administered from August 1, 2019 through September 30, 2019. The Study Plan can also be taken by any surgeons who want to reinforce their General knowledge and stay up-to-date on current General literature. We suggest starting before May 1st to finish before the ABOS exam window August 1st - September 30, 2019. You will receive your first daily emails the day AFTER your purchase. You can complete the study plan at your own pace by accessing any day in the study plan. Think of each day in the calendar as an individual lesson, just select any day on the Adaptive Calendar to access that day's lesson. The 2019 General MOC 90-day Study Plan delivers daily emails with a detailed list of what you will be covering for that day's plan. We have carefully selected 336 core orthopaedic topics covering trauma, spine, sports, pediatrics, adult recon, hand, foot + ankle, pathology, and basic science to prepare you for the MOC General Clinical Exam. Each topic also includes associated questions, and frequently-tested articles, often with a free full-text PDF. Take 15 interval module exams to test the material you have learned and reinforcing your knowledge. 3 General SAE exams focusing on previously tested topics, with high-quality board styled questions. The 2019 Hand MOC 90-Day Study Plan is designed to prepare US Physicians for the 2019 ABOS Orthopaedic Hand Practice-Profiled Recertification Examination, which is administered from August 1, 2019 through September 30, 2019. The Study Plan can also be taken by any surgeons who want to reinforce their Hand knowledge and stay up-to-date on current Hand literature. Before purchase log into Orthobullets with the account with which you want your purchased product to be associated. Payment is made through PayPal. Once your transaction is complete you are automatically redirected to your purchased product on Orthobullets. NOTE: Your login credentials on PayPal can be different than your login credentials on Orthobullets. However, be sure to log into Orthobullets with your usual Orthobullets email. You can confirm if your purchase was registered on Orthobullets by clicking "Purchased Products" found at the bottom of the black user menu that appears when you click on your name on the top left of the Orthobullets page. If you have any questions or problems email us at info@orthobullets with your Paypal transaction ID. If I lost some past daily Study Plan emails is there a way to get those study plan days? Yes. All past daily study plans can be found embedded in your Adaptive Calendar. Just select any day on the Adaptive Calendar to access that day's lesson. What if I am a member of the study plan group but am still not getting daily emails in my inbox? Remember Daily Study Plan emails begin the day after your purchase. Check your spam folder and promotions folder on your email. Because Orthobullets sends high volumes of email, our email is sometimes filtered into spam folders or promotions folders. Be sure to look there for our emails. If that is the case, mark us as "not spam" and add info@orthobullets.com to your contact list to avoid this in the future. If you are still not getting emails, send us a message at info@othobullets.com and we will help resolve this issue. How do I get to the Study Plan private group? Click Groups in the top menu, then click on Study Plan and select the plan you want to access from your list of joined Study Plans. If I bought another Study Plan, can I still get this one? Yes. Our Study Plans work on a 12-month premium content model. So if your PEAK subscription is still active you can be granted access to any of our Study Plans. If you have already purchased another Study Plan, and would like to be added to this one send us a message at info@orthobullets.com and we will make that change for you. Note: If you only have 4 months remained on your 12-month subscription, you will only be able to access the study plan for 4 months, and would need to purchase a new PEAK subscription to maintain access. What if my residency program has subscribed to PASS PRO and I am getting the Core Curriculum daily emails? As a PASS subscriber, you can be granted access to this and all other study plans. Please send us an email if you are a PGY5 resident and would like to add this study plan or be switched from the Core Curriculum to this Study Plan at info@orthobullets.com. Orthobullets and the Foundation for Orthopaedic Research & Education (FORE) are pleased to partner and offer CME for the MOC Daily Study Plans. A maximum of 112 AMA PRA Category 1 Credits™. $274 with CME & SAE. 1. Complete Daily Study Plans (spending on average 1 hr 12 min/day). 2. Take 2014AB and 2014CD and 2015AB Self-Assessment Exams and score a minimum of 20%. 3. Complete 6 of the remaining exams. 4. Complete Post-Course CME Survey. 1. Complete all 100 scored/recorded questions from Sports A Self-Assessment Exam (earns 10 ABOS Approved SAE Credits) and score at least 20%. 2. Complete all 100 scored/recorded questions from Sports B Self-Assessment Exam (earns 10 ABOS Approved SAE Credits) and score at least 20%. You must complete all course activity and obtain certificate before December 31st, 2019. Practicing orthopaedic surgeons preparing for the 2019 MOC General Maintenance of Certification Exam (MOC) administered by the American Board of Orthopaedic Surgeons. This internet enduring activity is designed to prepare surgeons in practice for the General Clinical Maintenance of Certification Exam administered by the American Board of Orthopaedic Surgeons. Through a review of 335 essential orthopaedic topics, recent academic literature, and a rigorous mock examination schedule, the learner will be well prepared for the tested content and computerized format of the MOC. Upon completion of this activity, participants will be able to: Demonstrate an understanding of basic science, clinical presentation, evaluation, treatment options, and surgical techniques for core orthopaedic topics, including: Trauma, Spine, Sports Medicine, Pediatrics, Foot & Ankle, Hand, Pathology, Basic Science & Anatomy. Foundation for Orthopaedic Research and Education designates this internet activity for a maximum of 112 AMA PRA Category 1 Credits™. Physicians should claim only credit commensurate with the extent of their participation in the activity. FORE (accredited CME provider) endorses the standards of the ACCME that requires everyone in a position to control the content of a CME activity to disclose all financial relationships with commercial interests that are related to the content of the CME activity. CME activities must be balanced, independent of commercial bias, and promote improvements or quality in healthcare. All recommendations involving clinical medicine must be based on evidence accepted within the medical profession. A conflict of interest is created when individuals in a position to control the content of CME have a relevant financial relationship with a commercial interest which therefore may bias his/her opinion and teaching. This may include receiving a salary, royalty, intellectual property rights, consulting fee, honoraria, stocks or other financial benefits. FORE has identified, reviewed and resolved all conflicts of interest that speakers, authors, or planners disclose prior to an educational activity being delivered to learners. Disclosure of a relationship in not intended to suggest or condone bias in any presentation. Rather, disclosure is required so participants can make a fair and comprehensive evaluation of a presentation. Preparing for MOC this past March, I bought the Miller online review & AAOS comprehensive review texts, but neither was as valuable as Orthobullets. In my opinion, your site’s organization, ease-of-use, customized tests, analysis tools, educational links and videos, discussion sections, and amazing attention to detail have set a whole new standard for orthopaedic education in the digital age. You guys really nailed it. Well done. Thanks for helping me rock the 2015 MOC exam, and see you next time in 2025! I used Orthobullets' 89 day study plan for the 2015 General Ortho Recertification exam by the ABOS. It is the only way I prepared. I passed the test and scored better than expected. It is a daunting task to organize and study all the subjects needed, but Orthobullets puts it in a nice little package. Not to mention, I got 112 Category 1 CME as well. Thanks Orthobullets, I will recommend you to all of my colleagues. UNBELIEVABLE. The amount of coverage in a concise, learnable format was right on. What a God send. ... It is phenomenal. I feel so effin smart...This old dog passed his (MOC) boards thanks to you!